2018 Lobsterfest – Thursday, August 2’nd! 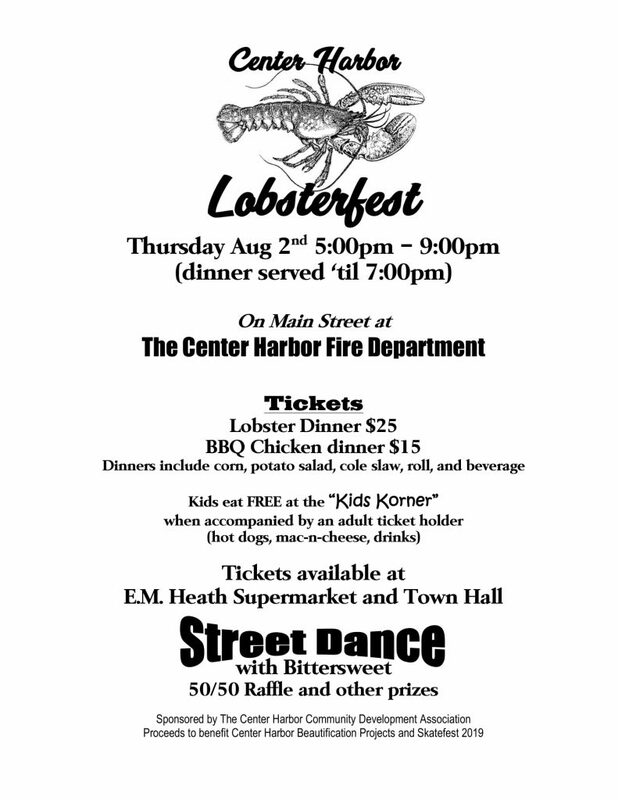 Please join our local community at the 2018 Center Harbor Lobsterfest – Thursday, August 2 from 5-9 at the Center Harbor Fire Station. Food will be served from 5-7. Come enjoy the beautiful summer weather, food and music by the Bittersweet band. Bring the kids! Profits go towards community development projects, such as the chairs by the bandstand and Center Harbor Statefest, a free winter event in February. Tickets are $25 for a lobster dinner, $15 for a chicken dinner. Kids meals (hot dogs or macaroni and cheese) are free. Get your tickets now at E.M. Heaths Supermarket or Center Harbor town hall. This is a rain or shine event. Tables will be set up inside the fire hall and under a tent for shade and shelter. Tables will also be set-up outside. There are only 500 lobster meal tickets and we’ve sold out every year, so please get your tickets early.